Rest your hands and let your eyelash extension tweezers do the work! Developed by Xtreme Lashes Co-Founder and Artistic Director, Noor Daoudi, specifically for eyelash extension application, ProComfort® Series Tweezers were designed to improve the application procedure by alleviating hand fatigue and tension commonly felt after long or all day applications. Its lightweight, yet balanced design will result in improved accuracy, stability and speed. Engineered with an ergonomic design using unique angles and curves, our patent-pending ProComfort® Z-Curve™ Tweezer allows you to effectively and efficiently maneuver around the contours of the face. The unique custom Z-Curve improves access to the full lash line, even the hardest to reach lashes on the inner corner of your clients' eyes. The incredibly precise angled tip was custom designed to increase accuracy and provide optimal control while improving your pickup, grip, attachment, and speed of application. This innovative tweezer is designed for ultimate comfort during your lash application. Lightweight to minimize hand fatigue, it has perfect symmetry, balance, and controlled tension. The custom, ergonomic design makes this the perfect tool for all eyelash extension application techniques and every Lash Stylist, from the beginner to the most advanced. The ergonomically-designed ProComfort® Tool Kit is unparalleled in comfort and precision. This premier collection of ProComfort® Series Tweezers and Micro-Spring Scissors allows stylists to perform applications with ease. The ergonomically-designed ProComfort® Tool Kit is unparalleled in comfort and precision. This premier collection of ProComfort® Series Tweezers and Micro-Spring Scissors stylists to perform applications with ease. Isolate even the smallest of lashes with comfort and control. Uniquely shaped to extend over the contours of the eyebrows, eyes, and nose bridge, this ergonomically designed tweezer features precision tips that offer remarkable visibility and stability during isolation and separation. Its lightweight and evenly distributed tension produce enhanced accuracy and aim. 14cm in length. Accuracy, always. Custom-molded fine point tips engineered specifically for precise eyelash extension pickup, coating, and attachment. Its lightweight and balanced design effectively produces enhanced accuracy and speed. 14cm in length. Revolutionize eyelash extension design with the ultimate application tweezer! Uniquely angled for precision pickup and attachment of multiple and single eyelash extensions, this versatile tweezer produces enhanced speed and accuracy when performing Volumation® or Single-Layer eyelash extension applications. Features slip-resistant ceramic tips in white to improve visibility during the application process. The Signature Tool Kit is designed with convenience and value in mind. This practical and cost-effective set of Signature Series Tweezers and Micro-Spring Scissors allows you to always have the right tools on-hand for applications. Designed for easy isolation and quick application, this Curved Tweezer features firm springs and is slightly more angled to allow easier access to the base of the eyelashes. Ideal for small to average-sized hands. 12cm in length. Designed for easy isolation and quick application, this Curved Tweezer features firm springs and is less angled than Signature Tweezer (S1-S) to suit users with longer fingers or larger hands. 14cm in length. Designed for easy pickup and quick application, this Straight Tweezer features firm springs and fine point tips for secure eyelash extension pickup and attachment. 13.6cm in length. Developed as part of the Faux Mink Lash Tray System, the Micro-spring Scissor is an essential tool for effortless cutting of eyelash extension segments. With an ergonomic design and tweezer-like grip, this uniquely designed tool offers enhanced control and precise cutting. Made with high-quality stainless steel, this allows for prolonged use and easy sanitation. Insider Tip: Designate a pair of Micro-spring Scissors and curved tweezer strictly for lifting and cutting within the lash tray. We recommended that you purchase another pair for other application-related uses. To learn more about the Faux Mink Lash Tray System, visit Online Education. Take your tweezers and tools wherever you go in this sleek faux leather case. This compact tri-fold design offers 24 spacious slots for your Xtreme Lashes Tweezers, Micro-Spring Scissors, and makeup brushes, plus an inner flap to protect tweezer tips and makeup brush heads. 8.25" x 5.5" closed, 18" x 5.5" opened. Tweezers pictured are not included. This value set of application essentials help minimize potential irritation and ensure longer-lasting eyelash extensions by creating the ideal application environment. Air Cleanse - Create a more comfortable and sanitary environment for you and your clients by providing dust-free, cleansed air in your workspace. This powerful yet compact air purifier and fume extractor is perfect for tabletops, desks, or countertops. Experience dual functionality with an activated carbon filter that cleanses air particles and odors- while extracting the air upward and away from your workspace. Three replacement filters included. Air Flow Fan - Creates additional air flow and pushes invisible adhesive fumes away from the client and Lash Stylist’s eyes, nose, and mouth. Hygro-Thermometer Clock - Maximize application time and adhesive bonding by creating the ideal environment for eyelash extension application. This easy-to-use tool is essential for monitoring the humidity and temperature of your work area, in addition to helping to keep track of application time. Two AA batteries included. Mini Fan - Improve air circulation during lash application with this easy-to-use one-speed portable fan. Targeted airflow exits from the top of the fan for optimal control. Use during every application to help the adhesive to cure faster and more evenly for longer lasting applications. Create a more comfortable and sanitary environment for you and your clients by providing dust-free, cleansed air in your workspace. This powerful yet compact air purifier and fume extractor is perfect for tabletops, desks, or countertops. Experience dual functionality with an activated carbon filter that cleanses air particles and odors- while extracting the air upward and away from your workspace. Measures 6.38” x 7.87” x 8.25”. Three replacement filters included. Insider Tips: Using an air purifier and fume extractor during applications helps minimize potential irritation in clients. If you work in a busy salon environment, then you’ll find the Air Cleanse to be especially beneficial for filtering out a variety of odors associated with other salon services. This activated carbon filter produces cleansed air particles by filtering away dust, debris, odors, and fumes. Change the filter every 3 months or sooner (if frequently used) to prevent dust build-up and ensure optimal function. The Air Purifier Replacement Filter is discontinued. To continue to create a more comfortable and sanitary environment for you and your clients by providing dust-free, cleansed air in your work space, please purchase the Air Cleanse and the Air Cleanse Replacement Filter. The Air Cleanse is also included in the Application Environment System. Create additional air flow and push invisible adhesive fumes away from the client and Lash Stylist’s eyes, nose, and mouth with this multi-speed gooseneck fan. When used in conjunction with the Xtreme Lashes® Air Cleanse, the Air Flow Fan helps minimize the potential for irritation for both Lash Stylists and clients during eyelash extension application. With a quiet, yet powerful motor, the fan's soothing breeze is almost undetectable as it propels adhesive fumes away. To use, simply plug the fan into a USB power source (computer, laptop, etc.) or wall outlet. No batteries required. Portable and USB powered – no batteries required. Wall plug adapter included. 1. Position the Xtreme Lashes® Air Cleanse on the right side of the client’s head at your application station to capture any adhesive fumes and extract them through the Air Cleanse’s carbon filter. 2. Position the Air Flow Fan opposite of the Air Cleanse, either directly on the treatment table or on a small side table. Utilize the Air Flow Fan’s adjustable gooseneck to reach the desired position for optimum client and stylist comfort. The air should flow above and across the client’s face. 3. Adjust the Air Flow Fan’s speed to the lowest setting. The breeze generated by the fan should be undetectable to both the client and stylist. Safety Precautions: Follow hygienic application practices by wiping the on/off button and any areas touched by your hands during the application with an EPA-registered hospital-grade disinfecting wipe used in accordance with the manufacturer's instructions. Maximize application time and adhesive bonding by creating the ideal environment for eyelash extension application. This easy-to-use tool is essential for monitoring the humidity and temperature of your work area, in addition to helping to keep track of application time. Two AA batteries included. Lightweight. Powerful. Quiet. Improve air circulation during lash application with this easy-to-use one-speed portable fan. Targeted airflow exits from the top of the fan for optimal control. Use during every application to help adhesive cure faster and evenly for longer lasting applications. Also ideal for all eyelash extension clients, especially those who received a multi-lash application (Volumation®). The Mini Fan can be used to gently and quickly dry eyelash extensions at-home after cleansing. Simulate your ideal lighting for every lash application and minimize potential eye strain with this portable clamp-on table light. This high-performance professional makeup light features 144 LED bulbs and a built-in diffusion filter that produces bright, glare-free lighting that is comfortable on the eyes and doesn’t feel hot on the skin. The Lashista LED Light distinguishes itself with its dimming touchstrip technology and multiple adjustment points that give you remarkable handling over lighting position for a more precise and beautiful lash application. With six brightness levels and four color temperatures (3200K, 4200K, 5200K and 6200K) to choose from, finding your preferred setting for lash application, makeup application, or other beauty services has never been easier. Portable, travel-friendly, and dual voltage (100-240V, 50/60Hz). The Lashista® LED Light is sold as a clamp-on table light. This product can also be purchased with either a Desk Stand or Floor Stand Attachment. 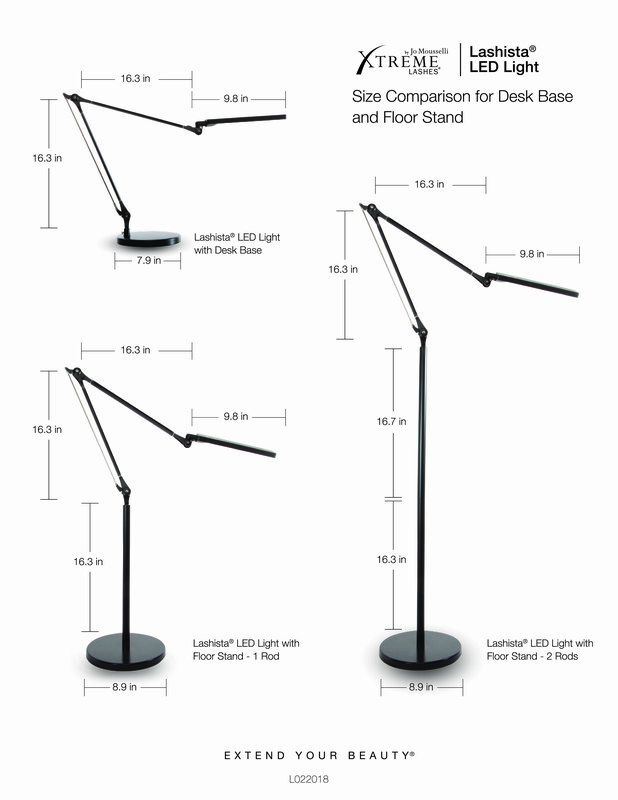 A desk or floor stand attachment designed to give the Lashista® LED Light more maneuverability and freedom when its standard clamp-on base cannot be used. Perfect for use in any workspace or home. Lashista® LED Light sold separately. Give your clients the most ultimate lash experience imaginable with the Xtreme Lashes® Contoured Memory Foam Pillow. Innovated especially for eyelash extension application, this pillow provides customized, gentle support while allowing the client to be positioned at the optimal angle for eyelash application. The removable and machine washable cover is printed with the Xtreme Lashes logo to actively promote your Xtreme Lashes® Services. Apply eyelash extensions with improved precision and comfort with the Magnifying Specs System. With 5 interchangeable lenses and 2 LED lights, these Magnifying Specs allow for reduced eye fatigue and greater application control. Other Names: Most Batteries - AG10, LR54, SR54, SR1130W. Where to Buy: A variety of brands and prices are available online. Insider Tip: It is beneficial to have multiple diopters on hand in the event that your comfort level or vision requires a weaker or stronger magnification throughout the day. Please note – Magnification diopter numbers vary from brand to brand. If you’ve previously used 4x or 5x diopter, the Magnifying Specs System’s 2.5x or 3.5x diopter will be suited for your needs. To conserve battery power, switch off LED light after every use. Put your newly learned skills to the test and build your application confidence, accuracy, and speed with this professional lash application practice kit. With anatomy-accurate features and a unique flat-head design, this closed-eye silicone mannequin head provides enhanced stability and comfort for Lash Stylists of all levels. Replicate a live person application experience in the comfort of your own home or business with this ultimate training essential. INSIDER TIPS: Jo Mousselli recommends new Lash Stylists practice either on a model or a mannequin for at least 3 hours a day for 3 days per week to develop the optimal application speed and accuracy. For an increased challenge, stack 2 Practice Eyelash Strips on top of one another to create a fuller, multi-dimensional lash line to perfect your isolation technique. To replicate a real-life application experience, trim the Eyelash Strips to create a variety of lash lengths, enabling you to apply to longer and shorter lashes. Clean the mask in between applications, using a gentle cleanser. With anatomy-accurate features and a unique flat-head design, this closed-eye silicone mannequin head provides enhanced stability and comfort for Lash Stylists of all levels. Replicate a live person application experience in the comfort of your own home or business with this ultimate training essential. Includes a bonus reusable mask that covers the mannequin head for easy removal and cleaning. For training in the application of eyelash extensions. Place onto the flat back mannequin head with eyes closed model to practice applying Xtreme Lashes®. Flat back mannequin head can be purchased from Xtreme Lashes®.